Posted on November 17, 2008 by D.C. The Dell Inspiron Mini wasn’t the only netbook receiving an upgraded model. It looks like there is a new model of the 8.9″ Asus Eee PC 901 available (or soon to be available) in Europe, specifically France and Italy, with a couple of notable upgrades. 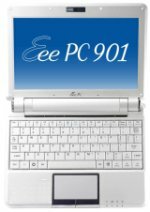 It looks like it’s being referred to as the EeePC 901 XP 16GB or 901GO / 901G0 (which could be confusing). The battery was bumped up to a 6-cell 8700mAh which appears to be a higher capacity than other 6-cells in that class, and as JK points out, it would give it at least 7 or 8 hours of regular real-world usage. The Solid State Drive (SSD) could put the 901 on par with the 10.2″ Asus Eee PC S101. The speed on it has been improved a great deal, which could mean swapping MLC < -> SLC as far as the flash storage. This entry was posted in Announcements, ASUS, Europe, Intel Atom, Netbook, News, Solid State Drives. Bookmark the permalink.